Branches can be used to create separate containers for certain files. For example, let's say the master branch is the production ready files, and each child branch are staging files. In this example, staging files can be put in MyBranch, and the MyBranch can be merge into the master branch when the staging files are ready for production. Use the git branch branch_name command to create a new branch. In this example, a new branch named myBranch is created. Use the git checkout branch_name command to use a branch. In this example, myBranch is checked out. Let's create a new file named branch.txt in MyBranch. Stage and commit branch.txt. There is now a file named branch.txt at C:\Users\john.doe\Sample. Use the git checkout master command to return to the master branch. Branch.txt is no longer listed at C:\Users\john.doe\Sample. While in the destination brach, use the git merge branch_name command to merge files from another branch into the destination branch. In this example, we want to merge MyBranch into master. Ensure you are in the master branch. 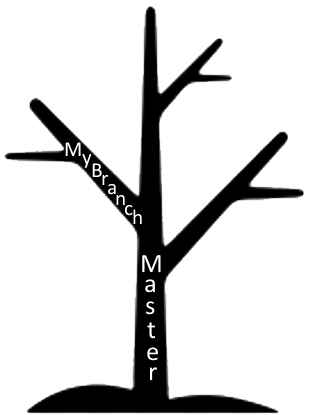 Use the git merge branch_name command to merge the files from MyBranch to master. Now, branch.txt is in the master branch.